The 2009 World Series of Poker may send rebuy events to the rail, according to Communications Director Seth Palanksy. "There is a movement to not have any rebuy events…There is the growing concern that a pro can buy a bracelet in a rebuy event." Surprisingly even guys like Daniel Negreanu, who once rebought 43 times in an event (which he eventually finished 3rd in), agree with this decision. "You want to talk about buying a bracelet? Let’s talk about Doyle’s bracelet when there were eight people in the tournament…The critics should look back in history and see where a bracelet has been bought." We've always held a similar opinion, but you rarely hear a pro say it. 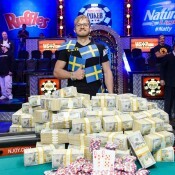 In other 2009 WSOP news, Palansky said that they are considering adding a winner-take-all event to the roster. While Palansky told Card Player that they will "likely" keep the Main Event final table delay, we've heard speculation that it will be moved earlier than November next year. While a delay will still occur, most WSOP officials we've learned believe that four months is too long. Look for a final table perhaps in September or October next year. So much for all the work we spent trademarking the clever "November NineTM."